With years of experience under us, we are your trusted express courier solutions provider. Delivering express document, parcel and cargo delivery service, with nationwide reach and catering to over 220 international destinations. Partnered with the world's best courier companies and trusted by the Philippines' top businesses. With over 700 outlets nationwide, we provide express delivery service, airline and sea travel ticketing and money remittance service. Banking on our people and expertise, we remain focused on our mission – to deliver what matters, when it matters. 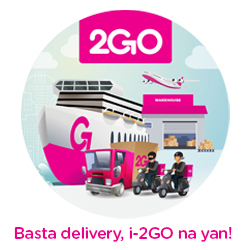 We are 2GO Express and we are Your Cargo Delivery Partner.